Any roofing material is going to have its advantages and disadvantages. The trick is to choose the right one for your personal taste, climate, budget, and desired amount of maintenance. 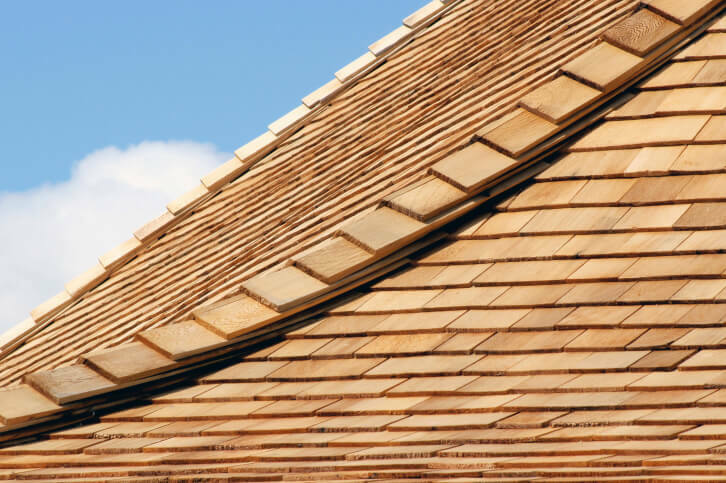 Cedar shakes have been a popular roofing material for many years because of their natural beauty and durability, but they aren’t the right choice for everyone. Below is a list of the main pros and cons to consider with cedar roofing. Pros: Cedar shakes have a natural, timeless look that complements just about any setting. Because of natural variances in the cedar, roofs tend to look unique. As the cedar ages, it fades to an equally attractive grayish-silver color. Cons: Shakes sometimes need to be replaced because of insect or weather damage. It’s difficult or even impossible to match the color of the older shakes exactly, which means your roof may end up with a two-tone look. Pros: Cedar shakes are durable, often lasting more than twenty years longer than asphalt shingles. Special treatments like power washing and adding preservatives can reduce maintenance and extend their life. Cons: They show wear and tear and have a shortened lifespan if they’re not maintained properly. While cedar is naturally resistant to rot and bugs, steps should still be taken regularly to prevent moss, mold, mildew, and insects from taking hold. Pros: Lightweight, so can be installed on just about any roof frame. Cons: Tricky to install properly. It’s important to find a roofing company with a lot of expertise and experience in installing cedar roofs to make sure the job is done correctly. Pros: Insulates more effectively than many other types of roofing materials, which can save you money on your heating and cooling bills. Cedar is wind-resistant and holds up well in strong storms. Cons: Higher risk of fire than other types of roofing materials. This risk can be reduced with special fire-retardant treatments, or by selecting shakes that have been impregnated with fire retardant before installation. Pros: You get an attractive and natural roof for a lower price than a clay or slate roof. Cons: Can cost substantially more than common asphalt shingles. Maintenance costs must be figured into the overall budget as well. As you can see, there are many different factors to consider before making the decision on whether to go with a cedar roof or not. Synthetic wood shakes are an option for those who want the natural look without the maintenance. Either way, make sure you consult with a skilled roofing professional before making any final decisions.